The ride started with a nice easy pace from home to Siglap to meet up with other riders. 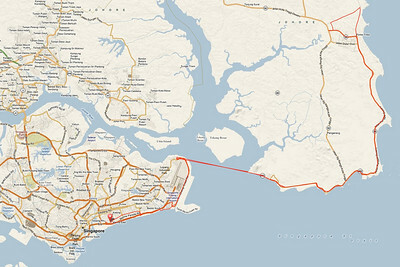 We then did a nice easy pace (~30km/h) to Changi Village. The Ferry ride from there to Pengerang port in Malaysia was nice and pleasant. So was the start of the ride from the port to the town on Rengit (also our stop for seafood on the return leg). From this point on, it was non-stop all out effort! For nearly 50km, we battled long rolling hills and headwinds along the coastal highway (90) until Kampung Nelayan. A short pit stop for water and ice-cream, then the sprint for Seafood back in Rengit! Seems we’ll be back for more torture soon!